Soooooo, I learned on Friday that I am going to have to have eye surgery on Monday and have to keep my face parallel to the ground for at least a week, 24 hours a day. Yippee. And even after that, I'm not sure how long until I get my sight back in the right eye ... again. So it looks like I'm out of the game again for probably at least a month. 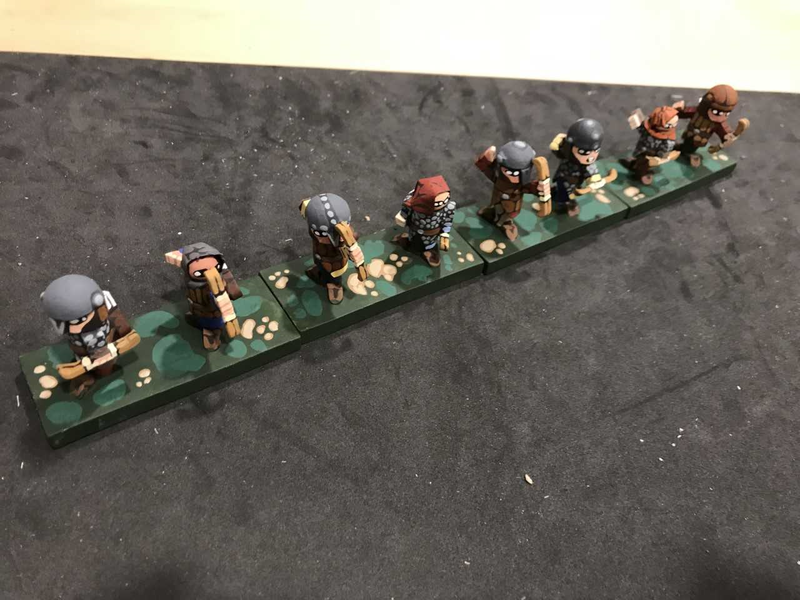 However, I did get some bases of the elves and goblins done for the units of the Battle of the Five Armies game I would like to do at some point, using the Normans/Saxons that I've already done for the Hastings game as the human units for the battle. I at least got them constructed, no paint though. 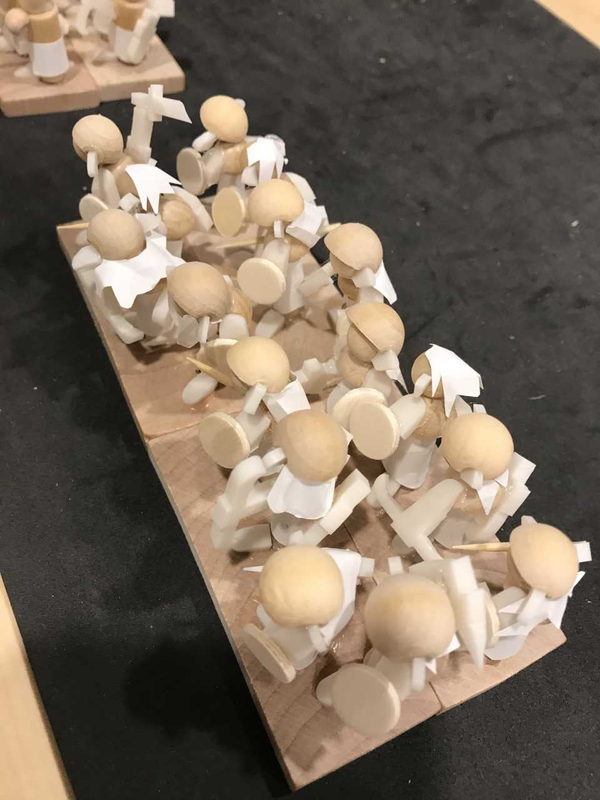 Also I think I might end up putting ears on the elves (or paint them on I can't decide) and also the goblin units to give them a proper "horde" feel will be another base deep, so they will be at least 2 wide by 3 deep stand units. Anyway, here they are. Elves. 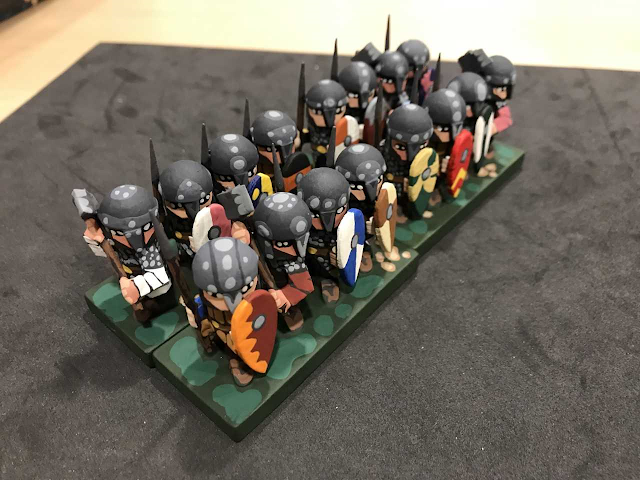 Long spearman/pikemen in front heavily armored with lighter armored bowmen in the rear. I wanted to have some diversity for this unit in appearance while still maintaining the order and discipline of the elven units. A second pic of them. The goblins I decided to go with figures that mimicked as best I could some of the old paintings and drawings for the older Tolkien books and Middle Earth rpg books. It has proven difficult over the years to do "bandy legged" figures as they are just too fiddly or too unstable. So I went with a peg construction with a slightly slumped over look but nothing too severe. More of "slightly" corrupted humans or elves in appearance. Still have the big bat-like ears though, gotta go with those! Looking forward to painting them. Hopefully I will recover quickly and regain my sight so that I can do that sooner rather than later. I'm not getting any younger! 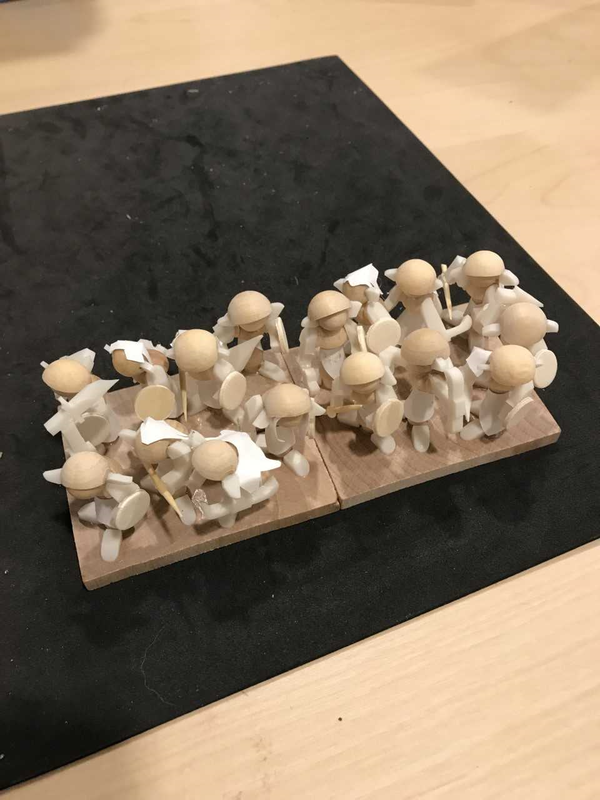 Okay, so my right eye is still not quite 100%, but I am getting binocular vision again so that means I can paint ... at least the wooden guys. Regular figures are a bit more challenging but I am still starting to paint some of those again as well. So I finished the unit of Norman archers that I had on my painting table now for a little more than 2 months, unable to work on them. Felt great to paint them! There is nothing new construction wise although I do notice that the more figures I do the more varied in terms of construction I start to make things like helmets, arm positions, and other minor details that add to the diversity of the appearance of the stand and figures, but really don't add anything to the "craft" of making these little fellows. Anyway, here they are. 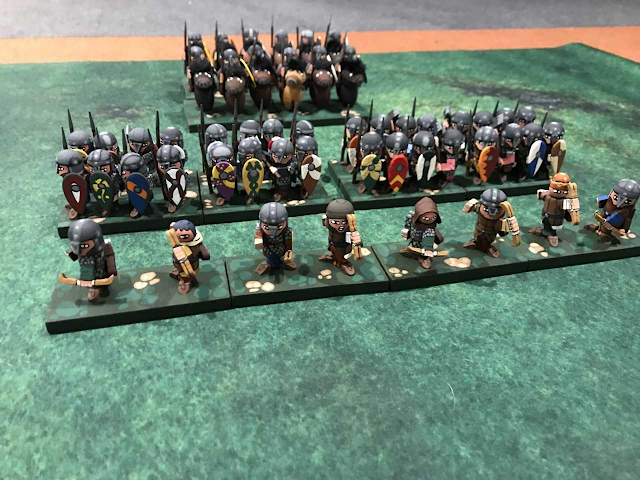 Although I am still invested in doing the Battle of Hastings game, it is a bit tiring to be doing Dark Ages figure after Dark Ages figure after Dark Ages figure, so I need a project that I can use these guys for, but will also serve as figures in another game. Since my first love is fantasy gaming, not historical gaming, I decided to revisit a game that I've been wanting to do for a long time, well before the Hobbit movies came out. I've always wanted to do the Battle of the Five Armies that is more in line with how Tolkien wrote about it, not how it was portrayed in the movie. These Dark Ages Normans and Saxons will fit perfectly into this game as the human men of Dale and such. And being able to do some units of elves, goblins/orcs, warg riders, and some hero bases thrown in for good measure will keep my motivation up for getting the Hastings project done as well. The inspiration comes from this old article and webpage that I just love. I'm not using these rules, but I am using the map, more or less, and the units described in the write up. Right now I'm doing a test base of goblins/orcs (general troops, not the special bodyguard ones) and a test base of elves. I'll post pics when I finish! Look what I found! I was going through Hobby Lobby looking to see if "granny grates" had different sizes for the hole or the thickness of the arms (I could not find any) and low and behold, there were not only grates of different shapes and sizes, but triangular grates where the holes were also triangular! I got a package of 10 grates for $1.59. They only come in one color and size (at least at this store), but you can make triangular and hexagonal shapes. Me, I was looking for the ubiquitous AK-47 look. A little blurry, but you get the idea. 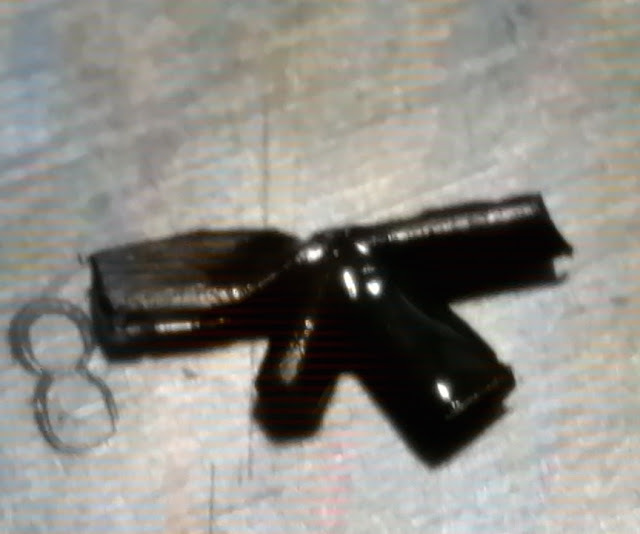 The rifle stock was flattened with needle-nosed pliers, as was the magazine, then clipped with sharp scissors or a craft knife to make the shape a bit better. 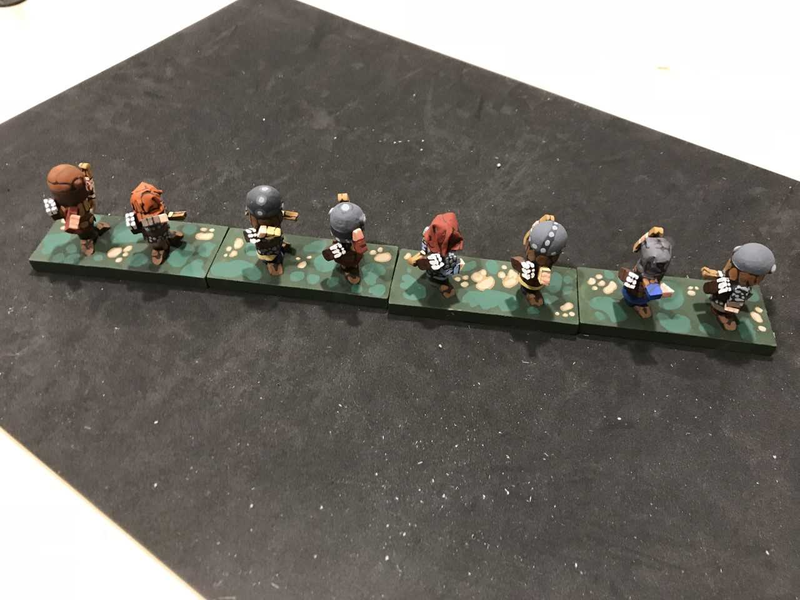 On 15mm figures, it works. One of the other issues I have been having is creating crests on hoplite helmets. Using dimensional paint works, but it takes layers to get a good result, which takes time and patience. 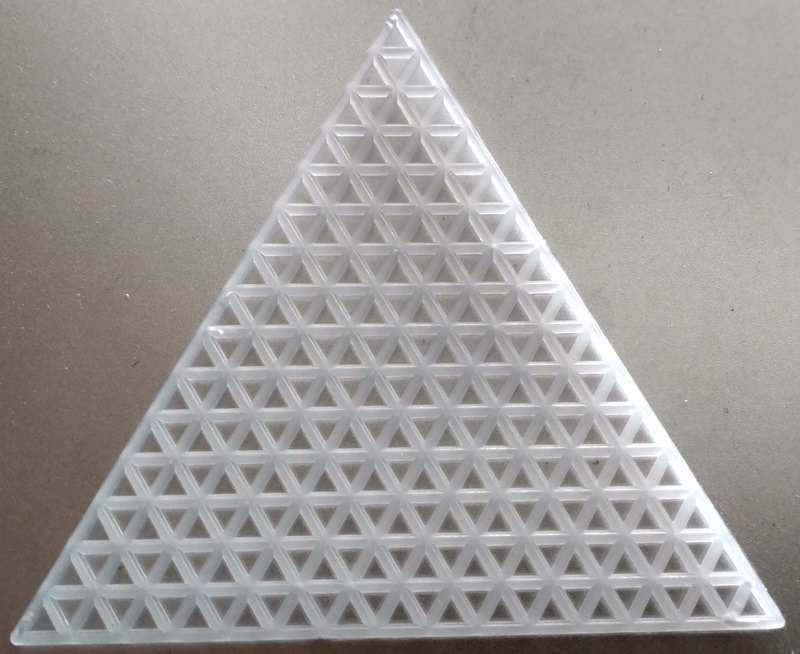 This new triangular shape fits nicely around the curve of a round-head furniture plug. 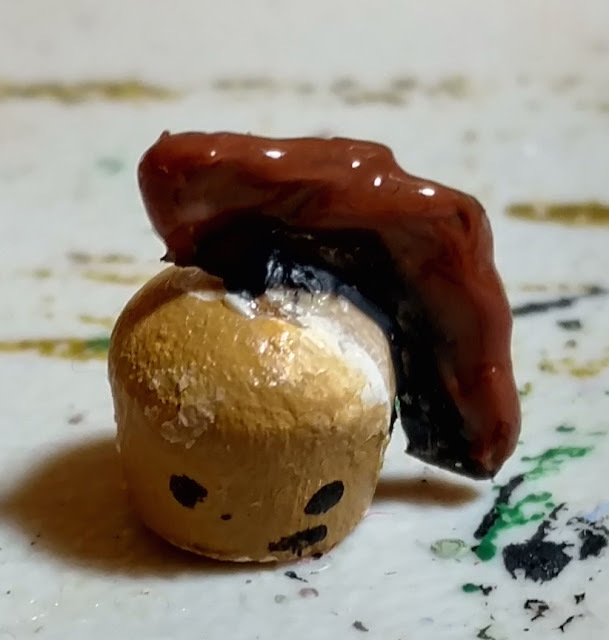 Add just a little dimensional paint (one layer, in this case) and it makes a fine horsehair crest for a 15mm helmeted head. Not only are there triangular grates, there are circular ones, with curved rows and columns. I could not think immediately of a use, so I did not buy one, but I am sure I will come up with something later, like gears. 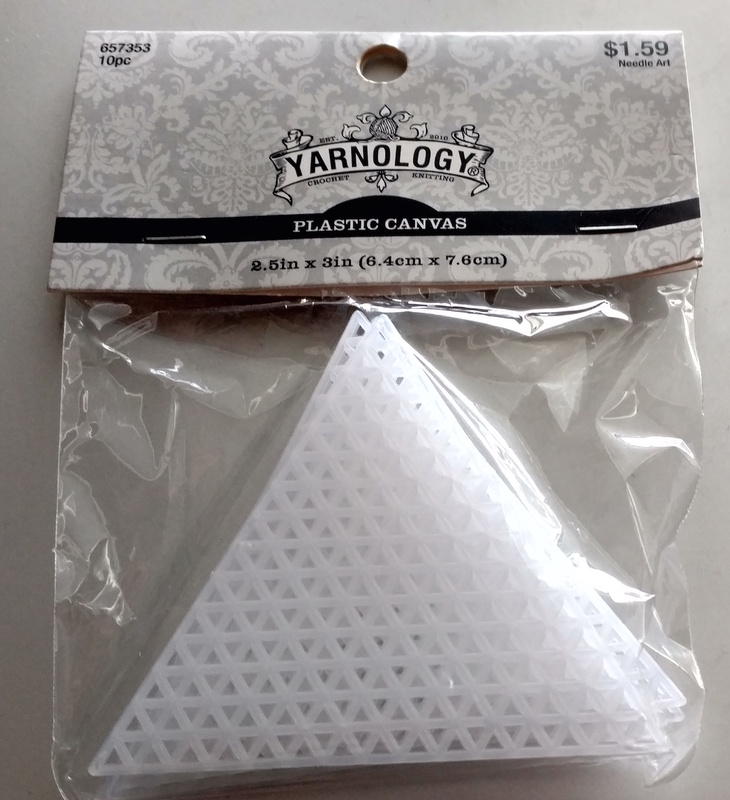 Today I wanted to talk about needlepoint mesh plastic canvases, a.k.a. "Granny Grating". Granny grating is a sheet of mesh plastic that people use for needlepoint. People have made armies out of these, in lieu of using the hair rollers of bygone days. 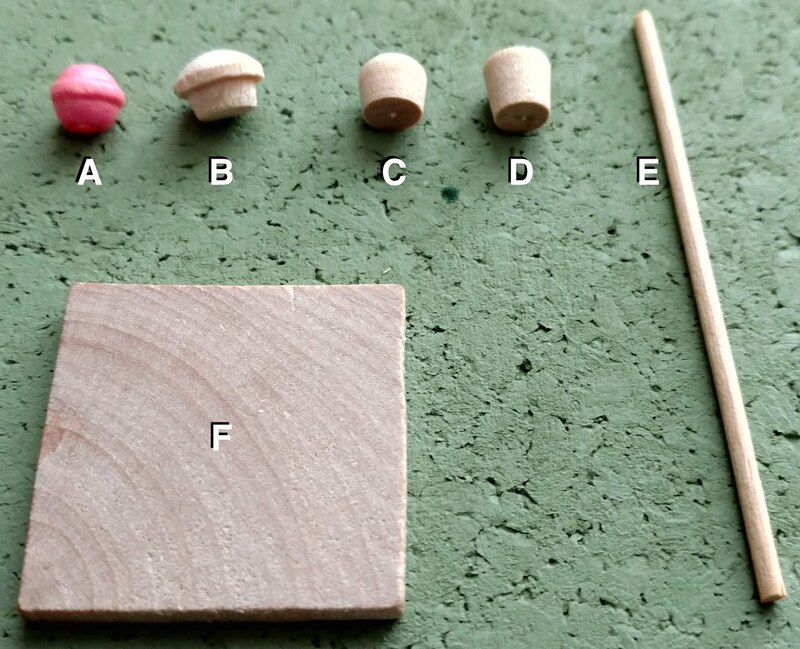 But for what I am doing, I want to show using them for details on smaller figures. 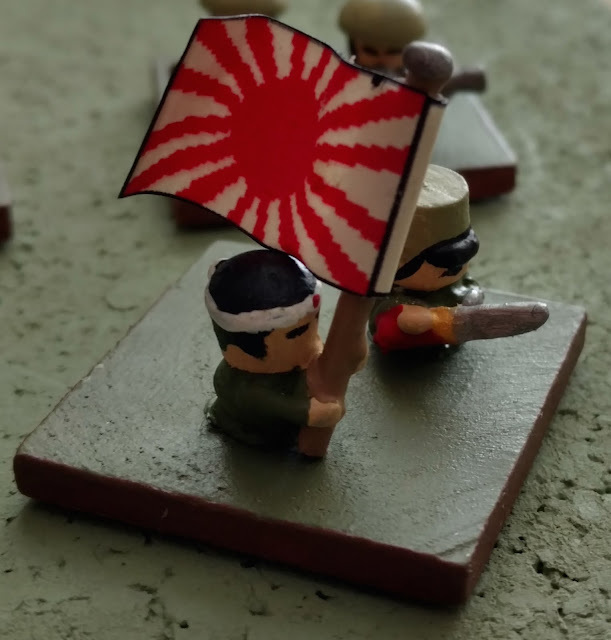 For example, guns on my minimalist WW II figures are typically simple mini-dowels – straight, round sticks – and any detail I want shown has to be added with dimensional paint. Using granny grating, however, I can cut out simple shapes and simulate SMGs, bolt guns, long rifles, etc. Best of all, the complex shape of the Japanese LMG can be recreated. 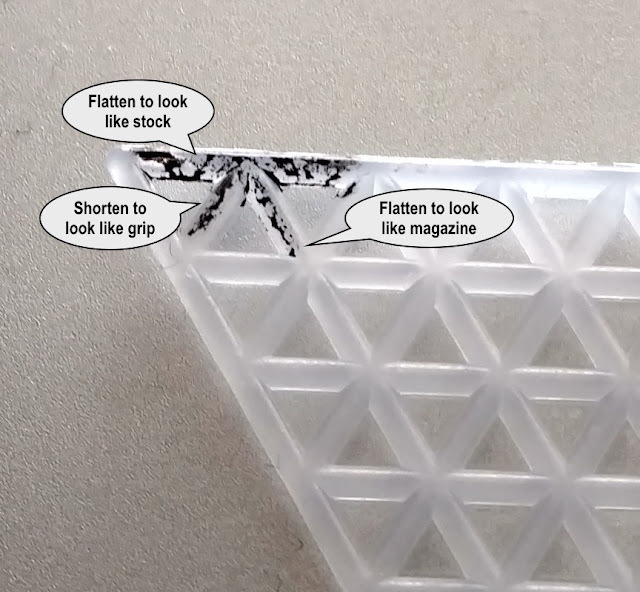 I find it better to use a Sharpie permanent marker to draw the basic shape, so I know where to make the cuts. This little guy will be a prone trooper firing his LMG off of the bipod. You can see the distinctive features, like the magazine protruding from the top of the weapon (similar to the Bren gun). Granny grating is easily cut, being nylon. 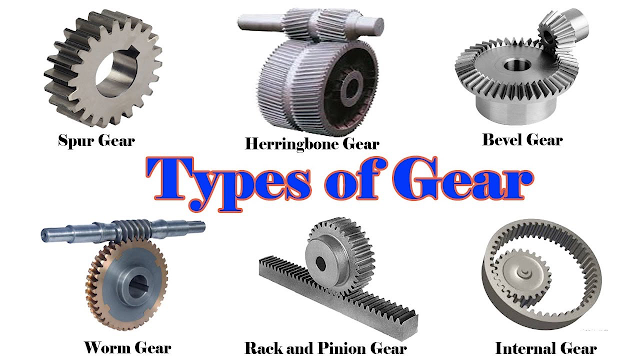 Use a very sharp blade to get rid of the 'strings' that tends to come with working on nylon. Of course, using granny grating is not limited to the little guys. You can use it for larger figures, like an engine ventilation cover on a vehicle, or even as floor grating for terrain. Like everything we show here, it is just another tool in your box to try and convey the shape of what you are trying to model. 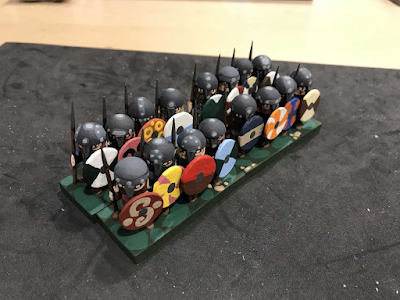 Finally finished the Saxon Fyrd unit I was working on which finishes off one wing of the Saxon line for the Battle of Hastings game. Nothing new, but here it is anyway. That means that I've finished one entire wing of the battle for each side. Here are some shots of the left wing/right wing of the Norman/Saxon lines for the Hastings game I'm working on. 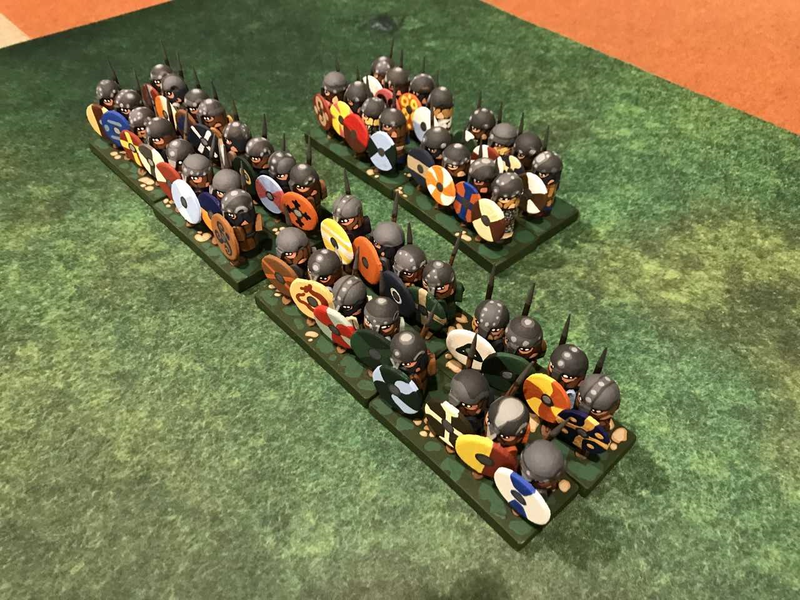 The Fyrd right wing of the battle line. The Breton (Norman) left side of the battle line which you've already seen, but I thought I would post another picture anyway. 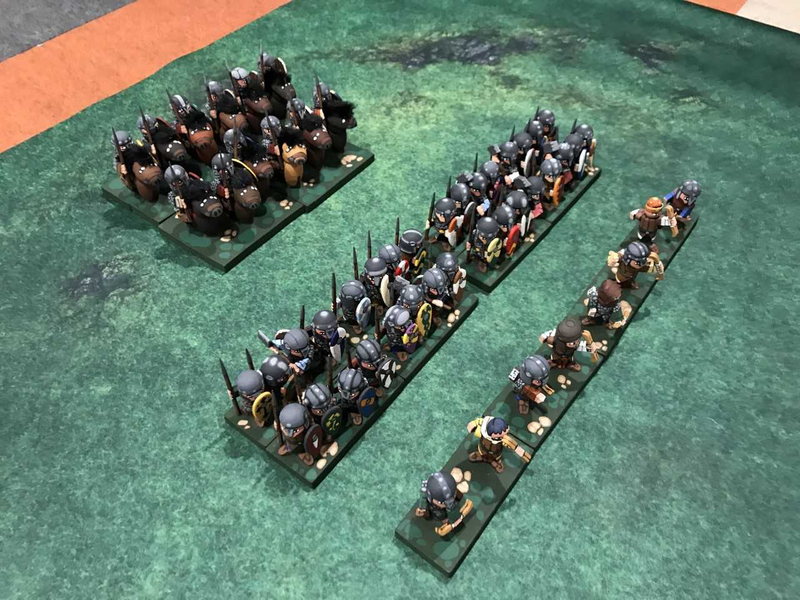 Onto the first half of the middle, which for the Normans means a repeat of the above units and for the Saxons two more Huscarl units (I did the first one a while back). Sometimes it is not how long a project takes to complete, but how long it takes to get started. 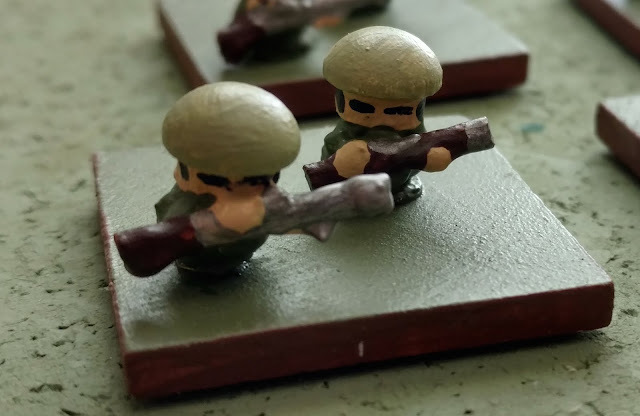 I crafted my WW II USMC/USA 1941 troops way back in January 2017. 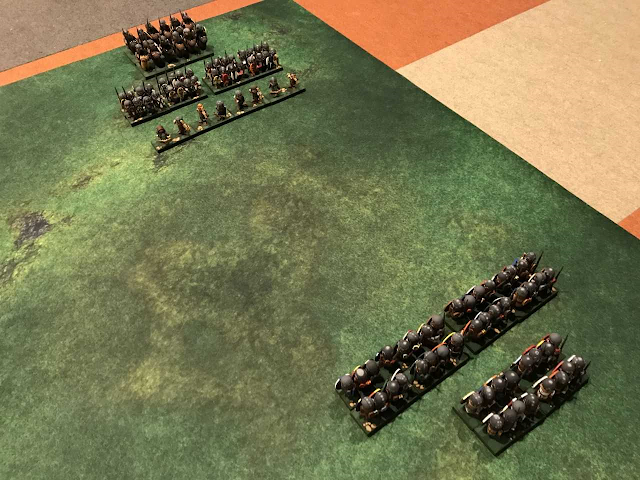 The idea was to create a small force – one infantry platoon in defense and two platoons in attack – so I could play a test game of Peter Pig's Poor Bloody Infantry (PBI) and see if I liked it. Next up, the special figures of the USMC and the start of the Japanese SNLF platoon. Yeah, that was almost two years ago that I was going to start my SNLF project. Like I said, what matters is how long it takes to start a project because making and painting your own figures is quick and simple. Once you start, that is. The picture above shows the parts that I used. This is a classic 'button' or 'mushroom' head plug. Makes for a great head with a helmet. This was used for all riflemen and LMG crew. This is a round head plug. This was used as the head for the standard bearer, who is bareheaded. 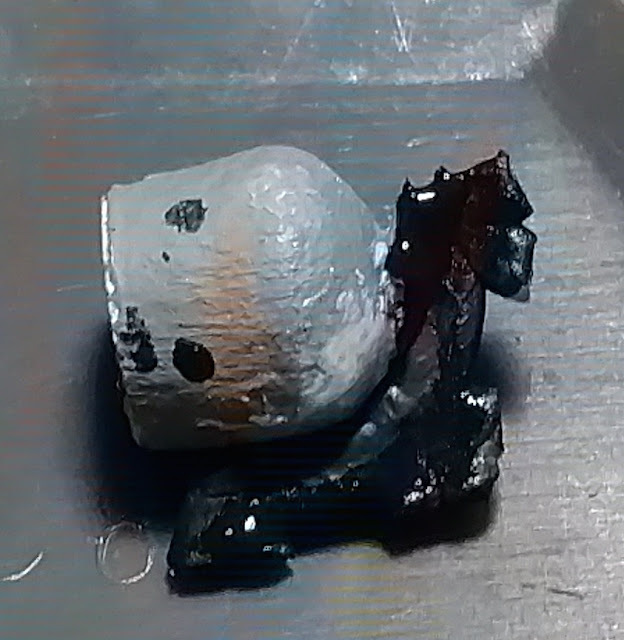 This is a flat head plug. This was used for the head of the officer. Flipping it upside-down it looks like the jungle cap with apron covering the back of the neck. This is a simple mini-dowel. I use these for the rifles, LMG, sword, and staff for the standard. I prefer these over toothpicks because of the standard diameter. 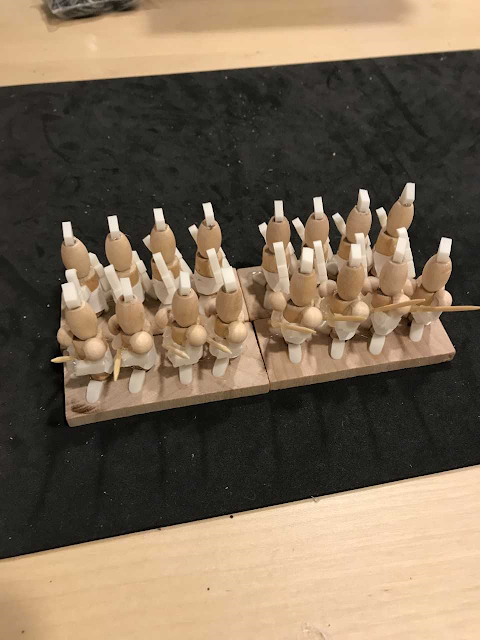 These are 3cm wooden bases for the troops. You can see the build is really simple for the riflemen. 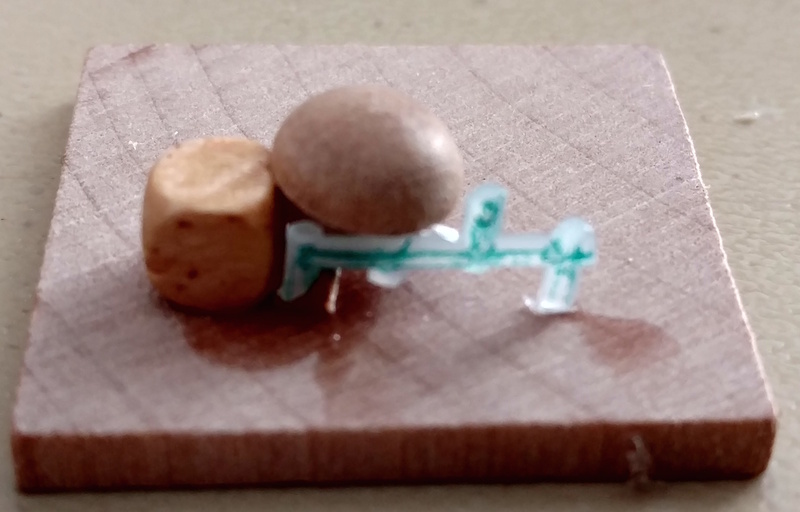 Glue the button head plug on top of the bead for the body and add a 1/2" piece of dowel for the rifle. I use dimensional paint to create the arms and hands. As you can see – or maybe not, as it is a little dark – the color scheme is very simple. The helmets are a light green (I have seen all kinds of colors for this) and a medium jungle green for the trousers and jacket. Although it might seem silly at this scale (12mm to the eyes, but chunkier) I always try and get the weapons correct. The Japanese Arisaka Type 99 rifle had a metal bolt mechanism and barrel, but the area between the bolt and the end of the barrel was covered in wood. The Type 99 Light Machine Gun was also made with the dowel, but was 3/4" long and uses a lot more dimensional paint to represent the gun stock, bipod, muzzle, and carrying handle. I do not have the distinctive magazine sticking out of the top. The next platoon I build with have the gunners in the prone position, so that detail will be present. The build for the figure itself is the same as for the rifleman. The standard bearer uses the round head plug for the head, but the same bead for the body. The flag is from http://www.warflag.com and is simply glued on to the dowel. The officer uses the flat head plug, flipped upside-down, for the head. A small piece of dowel, shaved flatter, is used for his katana, and the pistol is simply formed from dimensional paint. Here is the whole platoon, six rifle stands, three LMG stands, and one command stand. 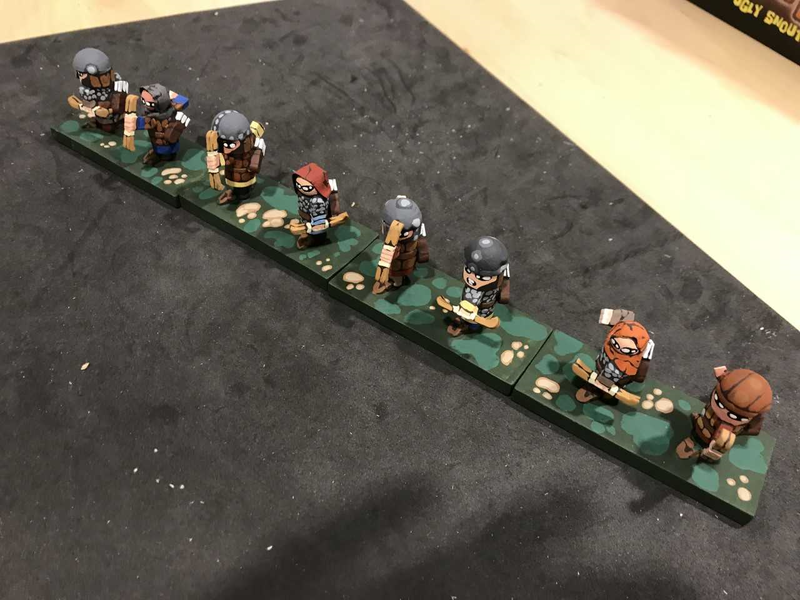 I need to make some casualty markers, and of course another whole platoon. Hopefully this time it won't take me another year to start! 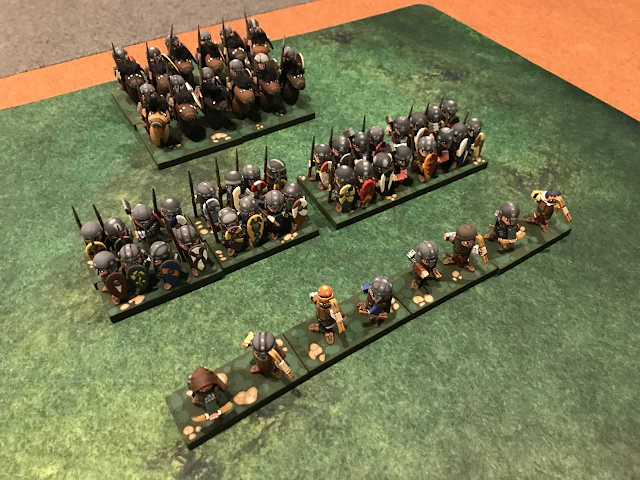 Got my last unit of Breton infantry finished today, which means that I have the entire Brenton Allied Command for my Battle of Hastings game finished. Here is the unit I just finished by itself. Nothing new construction wise, although I have started to just hot glue the figures to the bases now instead of screwing them in from the bottom. Not as strong as the screws, but clearly strong enough and it takes a) way less time to hot glue them on, and b) it is SOOOOO much easier on my hands. Screwing the figures to the base, even with a power drill, was really tough. Anyway, here they are. I did remember to paint the tunics sticking out below the bottom hem of the chainmail or padded armor this time (I forgot to do that on the Huscarls unit I finished earlier this month!). I didn't go with the angled shield arms for these, I went vertical with them, that is except for the axe-wielding guys, their front arms are obviously glued to the body at an angle. Not as cool looking as the angled shields, but easier to do. I might try and do a mix and match unit with some straight up and down arms and others angled on the same base. 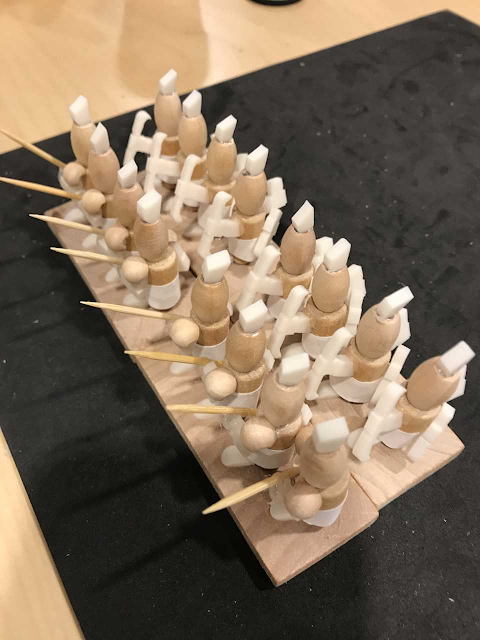 It gets tricky when you do stuff like that, though, because you don't really know how the shields are going to go in terms of spacing until you actually glue them on, which is the last thing I do with these figures. I decided to set up the Breton Allied Command in its entirety on my new battle mat. It's one of those neopryne (I'm sure I'm spelling that wrong) battle mats which is essentially a thin mouse pad that is 6 feet by 4 feet (the one I bought has those dimensions, you can get other shapes as well) with a scenic top part printed on the giant mousepad. I wasn't sure how my guys were going to look on it, it's pretty realistic looking, but I think it looks okay. I planned to use this battle mat for the actual game. Here are some shots. 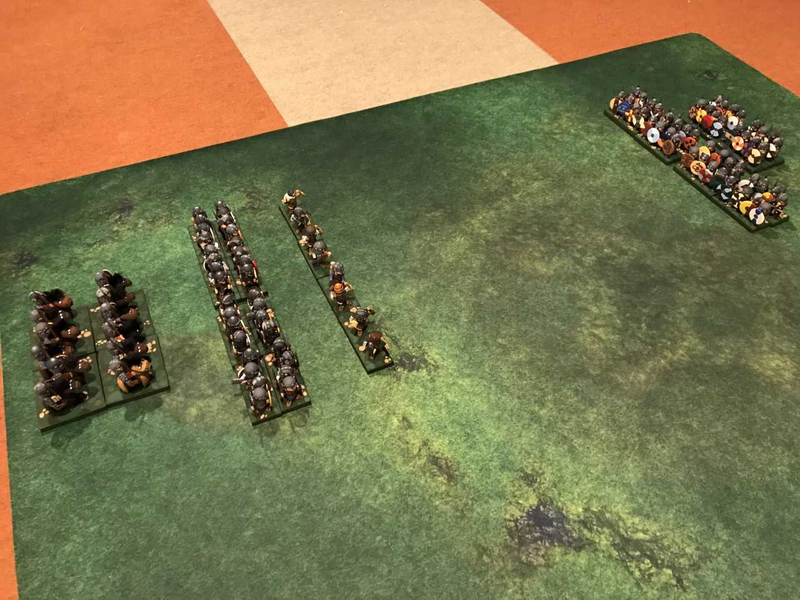 Archers in front, infantry behind, and cavalry ready to ride out when needed in the rear. 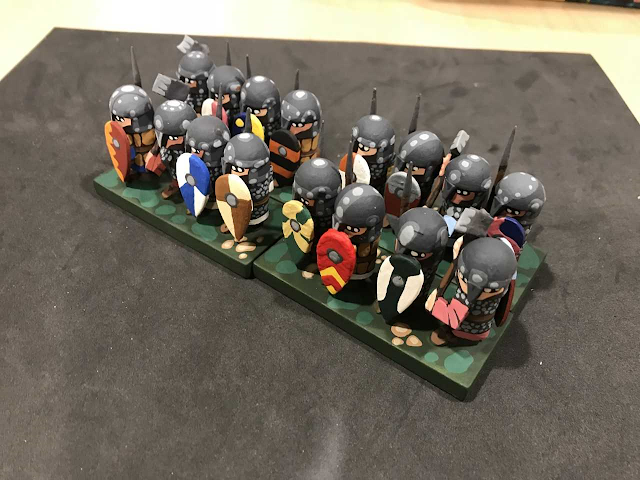 The next unit I'm working on is another Saxon Fyrd unit, and when I get that one done I'll have the Saxon's right side of their line finished (the one that opposes the Brenton allies). 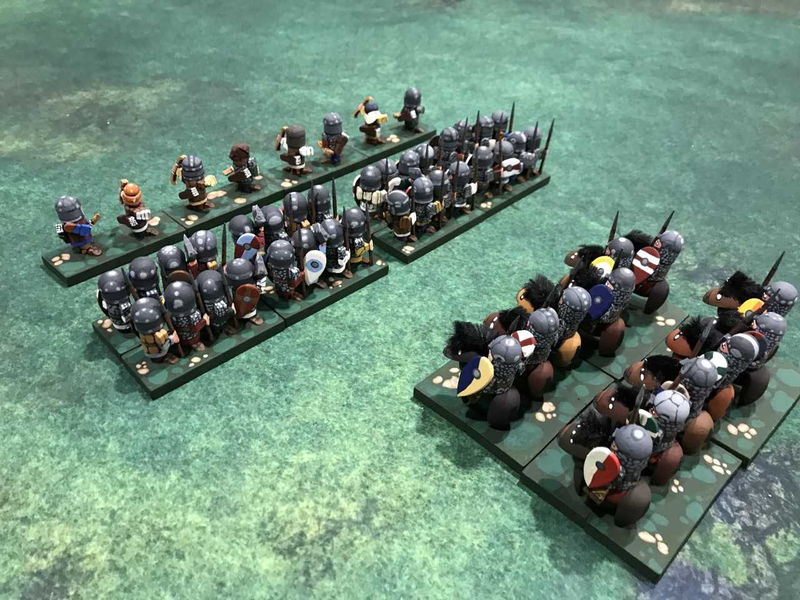 So, when I get that done, I'll post a picture of this entire side of the battlefield with the Saxons facing off against this Brenton allied command.